2018 TaylorMade 460 M3 9.5dg Head. Matching Cover and Key. Similarly if a Torque Wrench is pictured then a Torque Wrench is included. If No Torque Wrench is pictured none will be included. Flex: Regular RIP Phenom. Wrench: Yes. If a Head Cover is pictured, then a Head Cover is included. COBRA S3 MAX 10.5 DEGREE DRIVER WITH BLUR FUJIKURA REGULAR GRAPHITE SHAFT. CLUB IS IN EXCELLENT CONDITION. CLEVELAND LAUNCHER HB DRIVER. Standard Cleveland golf grip. This Cleveland driver is a 100% genuine item. In as new condition as this driver has only hit 6 balls on the range. All together i would rate this Driver at. Cobra Fly-Z Driver Regular Flex. Some marks from play. No cover. Can include a wrench if needed. See photos. SMALL INDENT ON CROWN & SOLE . Flex: Regular: Fujikiua Orochi Shafts: Driver 55g. The high launch can be explained by a thin crown which is just 0.5mm and has allowed engineers to fix a heavy weight deep within the clubhead, bringing the centre of gravity right down. Ping G30 Driver 10 Degree Regular Shaft. Condition is Used. Wear and a cool Iole of light scratches to the bottom. Shaft and head are in very good condition as is the cover. Dispatched with eBay delivery – Shutl 1 day. 10.5 loft Regular shaft with head cover and key for adjusting. TaylorMade Burner Superfast Driver 10.5 degrees with Matrix regular flex shaft. Golf pride multi compound grip in good condition. Condition is Used and there are some cosmetic scratches to the head as per the pictures although does not affect performance. Ping G30 SF Tec Driver 12 Degree Regular Flex. Condition is good. Any questions please ask. Collection SK23 or postage offered. TAYLORMADE M4 10.5 DEGREE DRIVER FUJIKURA ATMOS REGULAR SHAFT HEADCOVER & TOOL. Condition is New. Dispatched with eBay delivery – Shutl 1 day. Fitted with a Mitsubishi Diamana M 50 Regular Flex Graphite Shaft. Titleist 915 D2 Driver. 10.5 Degree Loft. Your parcel will arrive hassle free, quickly and with regular updates. Item number: TO0Tit321. SMALL INDENT ON TOP OF HEAD, SEE PICS . Flex: Regular RIP Phenom. If a Head Cover is pictured, then a Head Cover is included. If No Head Cover is pictured none will be included. Clubs have been played with and cared for in an appropriate fashion. Cobra Golf Men's King F7+ Adjustable Driver Black (Inc H/Cover & Tool) LAST ONE! Shop demo comes with head cover sorry no wrench. Unmarked as new. Please see my positive feedback from buyers. TaylorMade M2, D-TYPE Driver (2017 Model) 12* Adj Loft. A Flex ! Taylor Made M2, D-TYPE Driver (2017 Model) 12 Adj Loft. Condition is Used. This is a taylormade r11 driver. The condition is used and has scratches on the face, the bottom of the club and has a break-in as shown in one of the photos due to stones being on a tee box. This driver has served me great purpose and i have a new one so no use for it now. Willing to take offers! Rattle in head and dents to head also. Flex: Regular Blur Fujikura. Clubs have been played with and cared for in an appropriate fashion. The markings that you will likely find on products will show typical wear of models of its age. Mizuno JPX 825 10.5 Degree Driver Fujikura Orochi 55g Regular Graphite Shaft. Condition is Used. Dispatched with eBay delivery – Shutl 2-3 days. Taylormade R15 driver 9.5 regular Taylormade/Fujikura Speeder shaft with Golf pride grip. The original adjustment tool is included and head cover. Been a great driver with plenty of life left only selling as I’ve had a newer model. Thanks. Flex: Regular RIP Phenom. Clubs have been played with and cared for in an appropriate fashion. The markings that you will likely find on products will show typical wear of models of its age. THE CLUB IN THE IMAGES IS THE EXACT CLUB YOU WILL RECEIVE. HEADCOVER:TAYLORMADE AEROBURNER. SHAFT:MATRIX SPEED RUL-Z. LENGTH: STANDARD. GRIP SIZE:STANDARD. GRIP:9/ 10. 2018 TaylorMade Red M3 Regular-Flex Graphite Shaft Driver. Tense CK Series 50 Regular-Flex Graphite Shaft Right Hand tip. Standard M3 Grip. 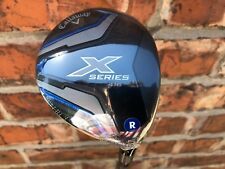 CALLAWAY XR R.MOTO 12 DEGREE DRIVER & HEAD COVER. The XR features Speed Step Crown to reduce drag & maximise speed through the swing. Super Callaway quality in great condition. Pic 2 is not a mark it's a reflection from the photo. Flex: Regular Speeder 57. TaylorMade has been pretty good at making drivers for the last 15 years. Now the latest model combines the best bits of all those that have gone before. This 25g of mass can be moved to a variety of positions in the 460cc head, changing the combinations of distance, forgiveness and draw/fade bias. TAYLORMADE M4 9.5 DEGREE DRIVER STIFF FUJIKURA ATMOS SHAFT HEADCOVER TOOL . Won in a competition at my club , tried for one round but prefer my own driver . Like new . No sky marks ! TAYLORMADE SLDR S DRIVER. REGULAR FUJIKURA SPEEDER SHAFT. 10 DEGREE LOFT. GOOD CONDITION - SEE PHOTOGRAPHS. REGULAR FLEX ALDILA TOUR 60 GRAM GRAPHITE SHAFT. 19 DEGREE LOFT. 100 PERCENT GENUINE. Lightweight shaft and grip promotes faster swing speed for increased distance. Shaft Flex: Regular Rocketfuel. If a Head Cover is pictured, then a Head Cover is included. If No Head Cover is pictured none will be included. Titleist TS2 Driver. Tensei Blue Regular Shaft. Taylormade RBZ Black driver, right handed, in great condition, complete with headcover. 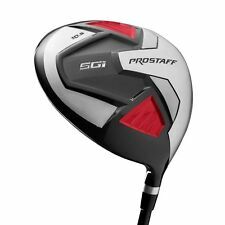 Shaft Grafalloy ProLaunch 60g. Callaway Razr X Black Ti 10.5 Degree Driver. Model Razr X Black Ti. Grip Callaway. Shaft Material Graphite. Loft 10.5 Degree. Club Type Driver. 10 New Unused, perfect new condition. NEW TaylorMade Japan Gloire Mens Driver 10.5º Loft - Only the very best! TAYLORMADE RBZ STAGE 2 DRIVER REG 10 5 BRILLIANT CONDITION.